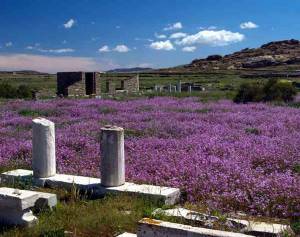 Delos, the Sacred Island of Antiquity. The Birthplace of Apollo. The entire island, all 5 square kilometers, is an archaeological monument. Remains of temples, holy places, houses, and settlements dating back from the Neolithic to the Roman periods. There is no place in the world where one will not find photographs of the Lion Terrace, with its unique marble Lions. The indoor Archaeological Museum is one of the best in the country. In fact, the site is so full and rich with antiquities that multiple visits are quite common. Only a short boat ride away, and history awaits you. A must for all visitors to Mykonos, Tinos, and Paros. At the end of the guided portion of the tour, you have free time to continue your explorations until the last boat departs for Mykonos at 15:00.